EcoPure's Valve-in-Head Whole Home Filtration System installs right on your incoming water line to protect your home's water-using appliances and plumbing. This open sump system is compatible with EcoPure universal whole home filters EPW2F, EPW2C, EPW2P, EPW2S, EPW2B and all other major brands of whole home, drop-in-style filters. Once you've selected the perfect filter, regularly replacing them is effortless, thanks to this system's bypass valve, mounting bracket and clear sump. Valve-in-Head Whole Home Filtration System - Clear EcoPure's Valve-in-Head Whole Home Filtration System installs right on your incoming water line to protect your home's water-using appliances and plumbing. This open sump system is compatible with EcoPure universal whole home filters EPW2F, EPW2C, EPW2P, EPW2S, EPW2B and all other major brands of whole home, drop-in-style filters. Once you've selected the perfect filter, regularly replacing them is effortless, thanks to this system's bypass valve, mounting bracket and clear sump. 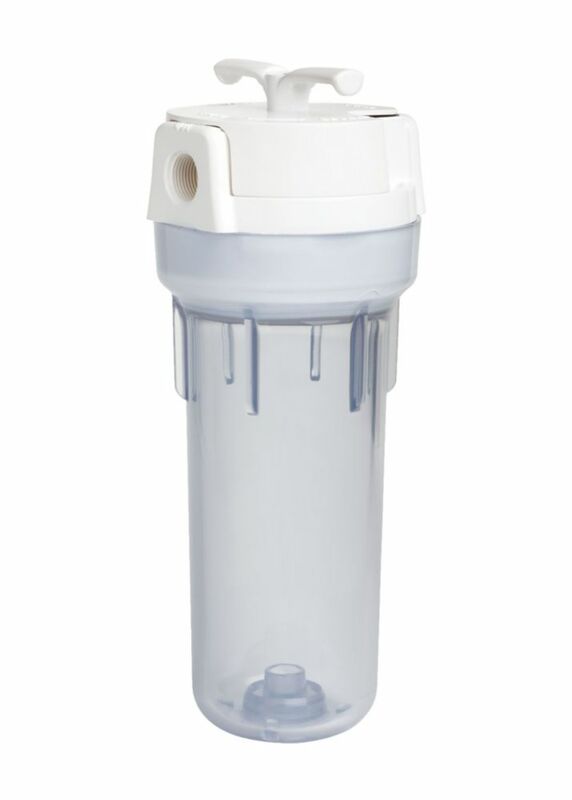 Valve-in-Head Whole Home Filtration System - Clear is rated 4.6 out of 5 by 13. Rated 1 out of 5 by Earl from A piece of junk, don't waste your money. I have... A piece of junk, don't waste your money. I have plenty of plumbing experience. It leaks at the fittings. The inlet and outlet is 3/4&quot; NPT. What do they filter out?? Its suspicious that they don't tell you exactly what they filter out. That's all I care about. Tell me what it filters out, and I'll know whether it will taste good after. This is a whole house filtration system that includes a 5 micron sediment filter only. You have the option to purchase a 5 micron chlorine taste &amp; odor filter HCX2CF5 which will reduce chlorine taste &amp; odor and sediment from the water supply. You might also consider undersink filtration options like reverse osmosis HCGROS5 if you are looking to remove specific contaminants from your drinking water.